Beautiful Mohican State Park in the rolling hills of central Ohio is a trip worth making. Located near the town of Loudonville, its rural surroundings make it a prime spot for camping, canoeing, hiking and simply enjoying the outdoors. Getting to Mohican is easy via I-71 and you will enjoy a scenic ride through Amish country on your journey there. A big attraction for visitors is the Clear Fork Branch of the Mohican River which flows through the park. Encompassing over 1100 acres, Mohican offers cottages, rental cabins, several campgrounds and camping areas for your overnight stay. Pavilions can be rented for family reunions, work picnics and parties. Mohican Lodge and Conference Center can provide meeting rooms for your business needs as well as a comfortable room, indoor and outdoor pools, a sauna and gift shop for your downtime. Bridle paths for horseback riding as well as a mountain bike trail wind through the park. Fishing is a popular activity both in the river and Pleasant Lake which also boasts Pleasant Hill Dam as a place many go to see. The park campground offers a swimming pool although the adventuresome choose to kayak or tube down the river to cool off on hot summer days. The beauty of Mohican State Park isn’t limited to just one season. For a memorable view of the autumn colors climb the steps of the fire tower to peer down on the towering trees in their fall glory. Many come to see the Gorge Overlook with its fantastic views and the covered bridge which is a favorite. A snowmobile trail entices the hardy to come out in the winter and enjoy all the park has to offer. Surrounded by Mohican State Memorial Forest and located close to downtown Loudonville there is plenty to do nearby the park for your long-term stay. Festivals including an antique car show and a balloon fest are held over the summer months. At the camp store in Mohican State Park guests can buy souvenirs of their stay and gifts as well as coffee and ice cream. Nature programs are offered throughout the summer and organized hikes and other family activities, as well as weekend movies at the Amphitheatre will keep the entire family entertained during their stay. 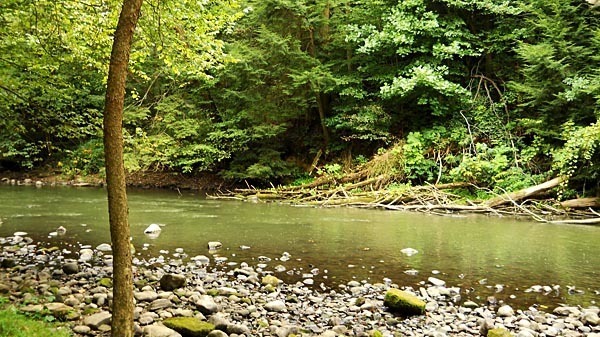 Whether you are looking to enjoy outdoor sports or you simply want to relax amid the beauty of nature, a visit to Mohican State Park in Loudonville, Ohio is well worth the drive. Mohican State Park is located in southern Ashland County bordered by State Routes 3 and 97, close to Loudonville, Ohio. The park can be easily accessed from Interstate 71. Last updated by Kristi Anglen on 30 May, 2012 in Destinations.